Had pieces of poop come out bathtub drain when trying to take a shower, and when asked for a refund, the manager refused, because she stated I started the shower, so I have to pay to stay. Close to Pomona Fairplex main reason we booked here. I didn't have time to read reviews. There is too many cockroaches in the room. Person at Denny's down the street said a lot of transients. The rooms are nothing as described. They still walk in with a DO NOT DISTURB hanging on the door. Someone went through my stuff while I was gone. Manager was asked who went into the room while we were out, she said herself and when asked about the moved around items in the room the manager started getting very agitated and didn't know what to say. Asked for a refund from them 2 days before all this happened, so I could leave and go somewhere else, they said I would have to deal with the site I booked at when my stay was over. This place is a NO. They charged my card b4 i got there. I wanted to use a different card but was told " we already ran this one". Drug addicts outside my room. Ac was hard to use. Handles missing from faucet. Just a run down hotel. Needs to be refurbished. Walls were patched up badly. Tiny roaches running around in the early morn. I decided to stay at this hotel due to the pricing. Now I know why the price was so low. 1 microwave to all room was located at the front desk area. Rooms show wear (front door looked like it had been broken into dead bolt was broken, but facility placed a badly screwed in one on the top of the door). Sheets looked very worn, blanket had cigarette burns. They had been cleaned but very worn. Check out was at 11:00am with notice if customer did not check out by 12:00nn an additional day would be charged to customer. At exactly 11:00am housekeeping opened the door and stood at the door until we vacated. Very uncomfortable feeling. I stayed at the Lemon Tree while attending an event at one of the Claremont colleges. The room is plain, but adequate, and the motel is located next to the freeway. There is a Denny's within walking distance. The Lemon tree offers basic accommodations at a reasonable price. They need a remodel! The walls were disgusting. The floor was not sweep or mop. Paint was hanging off the walls. No dresser drawers, no coffee pot, no blow dryer, tub and shower were stained, and cracked water fixture, everything needed new fresh paint , missing light switch, air conditioning unit barely worked. It was awful, I was embarrassed to say where I was staying. Nasty....duct tape about, exhaust fan falling out of ceiling, bathtub disgusting, burn holes, hard mattress, toilet seat not fastened and wrong size, need i say more? Stayed here 2 nights room was clean and had a fridge the microwave that did not work. 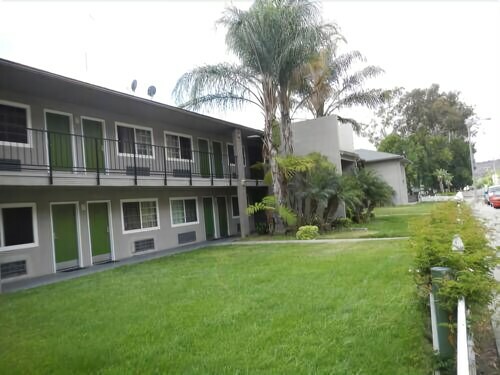 Lemon Tree Inn places you within a few miles (5 km) of Fairplex and American Museum of Ceramic Art. This 67-room motel has an outdoor pool, free in-room WiFi, and free self parking. A TV comes with cable channels, and guests can stay connected with free WiFi. An outdoor pool and free WiFi in public areas are features at Lemon Tree Inn. You can put free parking to good use if you drive. Helpful staff is there to provide concierge services, as well as offer insight about the area. Recreation features at Lemon Tree Inn include an outdoor pool.